The Collective Space provides 8 bespoke, glass-fronted private offices overlooking the iconic Hope Street. The space is knitted together by an elegant mix of soft-furnishings and a stylish boardroom table. Each suite is fully furnished and can accommodate between 2 and 4 people comfortably. Brief - Quantum2 to design and fit; 8 new office and an agile working area known as &apos;The Collective Space&apos;. With the opening of the Collective Space, Liverpool Science Park (LSP) has furthered its commitment to supporting local SMEs and young start-ups. Quantum2 were approached and tasked with a brief to design and fit 8 new offices in this project, each with; a glass-fronted wall and door that allows tenants a private space to work whilst still being part of an active wider community. Liaising with the operations team at LSP, a thoughtfully designed and well-crafted communal space that knits the space together and blends in perfectly with the views - over the iconic Hope Street. 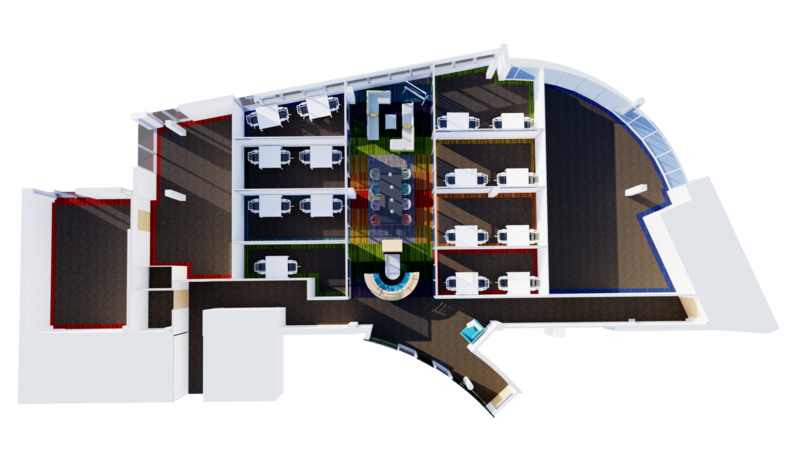 Concepts and designs were all drawn up by Quantum&apos;s in-house interior design team. The reimagination of the space has allowed Liverpool Science Park to maintain its position as one of Liverpool’s key providers of Grade-A office space. High-specification air-conditioning units and ergonomic LED lighting are a standard in each suite. The unique design of the &apos;Collective Space&apos; will ensure that it carries its own identity and is instantly recognisable in Liverpool’s expanding work-place scene. Quantum2 3D designed and specified everything within the new space, including; carpets, walls, doors and furniture, right down to the directional signage posts. Quantum2&apos;s highly trained and experienced installation team completed the installation. Deadlines were met with 100% satisfaction and within budget.